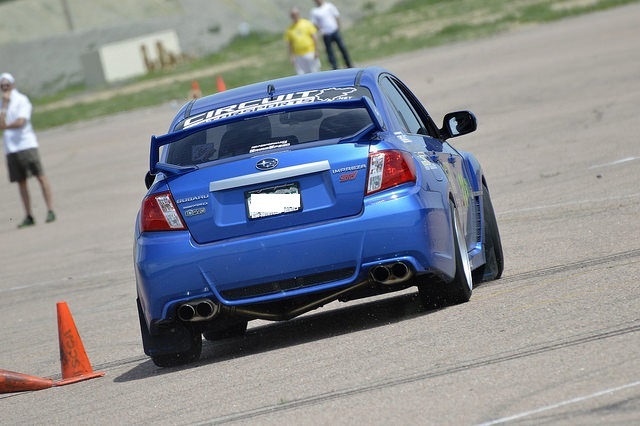 Circuit Motorsports: Flat-Out: 2016 Autocross Has Begun! After a several month winter hibernation, I have returned to the racing scene, and thus to my blog posts! I know you all missed hearing about all the adventures my dear STI and I have gone on. But first we need to recap last year. I missed half of the season due to a critically massive engine failure. For those who don't recall, early in May I was at an autocross event, on my last run of the day, when the car decided to turn itself off mid-run and never start again. We determined later that it had suffered from old/bad oil (and a starvation thereof) as I went around the corners, which caused a piston to convert into complete shrapnel and then run through my entire engine system. Anywhere oil goes, that shrapnel went and destroyed everything, including block, heads, and turbo. An attempt at a bump start also stripped my clutch and bent one of the cams. Two months and $14,000 later, however, I was back up and running with a brand new engine that included a Killer B deep baffled oil pan and oil pickup, GrimmSpeed up-pipe, down-pipe, and cross-over pipe with thermal coating, and Cobb cat-back exhaust. I ran the rest of the season, but had missed so many events I didn't even qualify for the season. So with my tail between my legs, I limped the old bird into the garage, converted her to winter mode with snow tires and stock suspension, and went about my life working 40 hours a week. Oh, and then in December my wife and I had a baby boy. But now, spring has sprung in the Rockies! 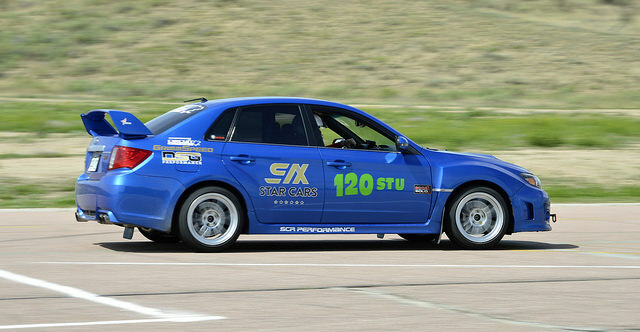 Sadly, other obligations precluded me from attending the season opener, but on May 29th I had a spectacular time at Summer Series #2 at Pikes Peak International Raceway. I'll go ahead and Quentin Tarantino this post, and give you the ending first. For the first time ever in my amateur racing career....... I WON. One of the changes made over the off-season was a purchase of new wheels and tires from fellow CircuitMotorsports sponsored driver, Tyler Jago. Last year I ran a set of Hankook Ventus RS3 tires on a lime green set of 18" Kazera wheels. This year I'm using Bridgestone Potenza RE-71R's on some 17" Enkei RPF01 wheels. The wheels themselves are much lighter and an inch smaller, and the difference in feeling between the Bridgestones and last years Hankooks is astounding. Suddenly the car turns where before it would have plowed through, and it finally responds the way I want, and expect it to. Fortunately, I was able on my final run of the day to set a clean 62.51 seconds. Thanks to some cone penalties Sal suffered, I found myself for the first time in the winner's circle. Only a half second separated us, but it was MY half second. The trophies have been some kind of glass the last few years, with last year using beer glasses and this year appearing to be more intended for scotch or whiskey. Class trophies are awarded to a certain number of drivers based on how many are in a class, with the first place glass sporting a shiny, gold rim. 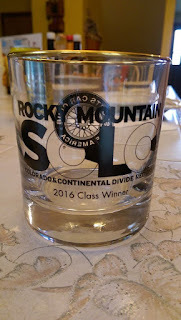 It was a great feeling to finally add a gold-rimmed glass to my small collection of "regular" trophies from last year. Hopefully there will be more to come throughout this year! 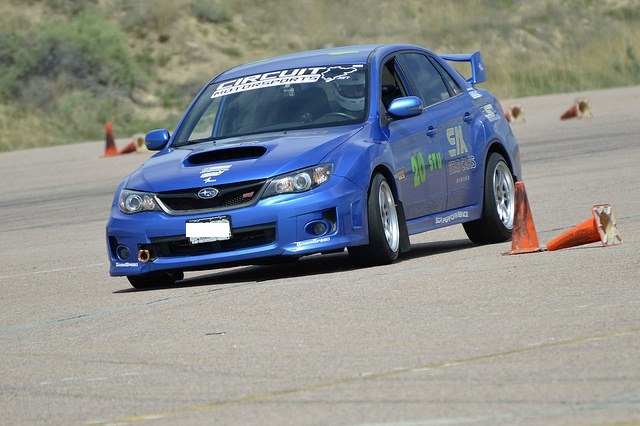 I'm also enrolled in an SCCA Tire Rack Starting Line school, which provides me an entry to a National Tour event as well as Track Night in America. Stay tuned for details on those events in July. Additionally, Subaru Growl Fest is August 14th and the Rocky Mountain Subaru Festival shortly after in September. I'll also be trying out Time Attack at PPIR for the first time this year. The only things to be added this year will likely be Defi digital gauges to monitor oil temperature and pressure in order to prevent another cataclysmic engine catastrophe. I can't thank my sponsors CircuitMotorsports.net, DSG Performance, and GrimmSpeed enough for all their support. This win is as much theirs as my own. Until next time, see you at the finish line!